This was an enchanting, exciting book and the first installment of the Cripsin series. I would recommend it to anyone who likes stories about action, adventure and unexpected friendship in historical times. It had many good messages and ideas. I think the main idea of this story was that even if you start off as enemies, you can still become friends, with trust and hard work. An example of this is Crispin and Bear. When they first meet, Bear enslaved Crispin, but in the end, they risked their lives for each other. In Crispin's hometown, he was treated like dirt, but Bear gave him confidence and believed in him. Crispin gave Bear a friend and someone that Bear could always trust. Crispin, a 13 year old peasant lived in a village called Stormford located in England in 1377 AD. When his mother dies, Crispin is alone, and he’s doubting that anything worse can happen, until people falsely accuse him of theft. People are given permission, by Lord Furnival, to kill Crispin on sight. The priest gives Crispin his mother’s cross of lead. Later Crispin finds the priest murdered. Crispin runs away but is pursued. Later Crispin is taken in by a juggler named Bear, and they become friends and risk their lives for each other. In the end, Crispin learns that he is Lord Furnival’s illegitimate son. Crispin is a scrawny, malnourished boy with black, scraggly hair. He is shy and scared at the start, but later on he learns to be so incredibly brave that he risked his life to save his friend Bear. He hadn’t been educated and so he didn’t know how to read or write. He was sneered at in his village because he had no known father and his mum was very frail and couldn’t work very well. The Green Man Tavern is the place that Crispin and Bear stayed at in a big city called Great Wexly. Bear books a special room that has a secret room that not many people know about. When the soldiers came looking for Crispin, he hid inside the secret room. The soldiers destroyed the place, and everything was broken. If Bear hadn’t told Crispin where the door was, Crispin would have died. 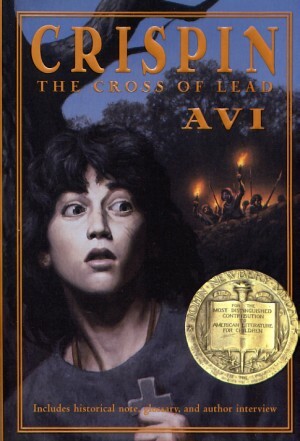 Sources: Image from good reads, all rights of the Crispin series belong to Avi and Disney Hyperion.